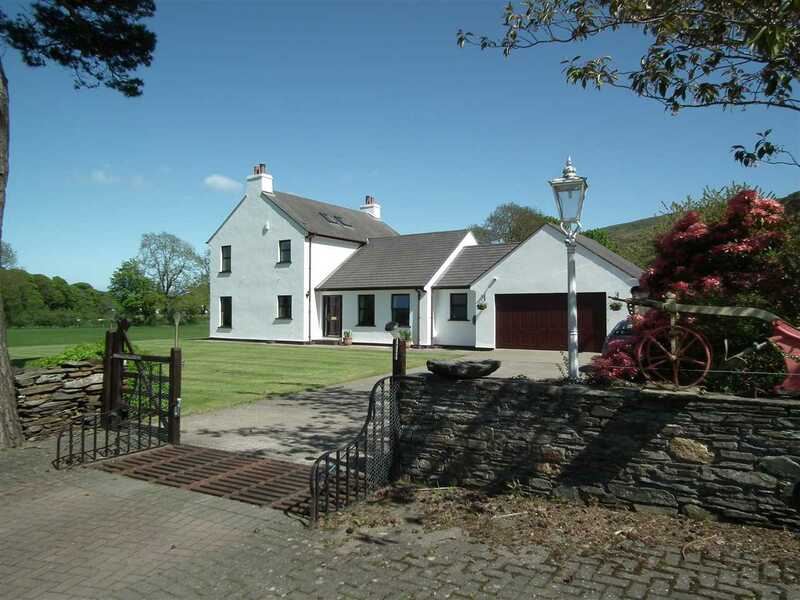 Modern Detached Farmhouse Set in Approx 8.5 Acres of Outstanding Countryside. Briefly comprising Lounge, Dining Room and Spacious Breakfast Kitchen. Superb 27 ft uPVC Double Glazed Conservatory with a 'Blue Glass' Thermal Roof. Utility, Cloakroom WC and Wine Cellar. Ground Floor Study / Guest Bedroom with En Suite Facilities. 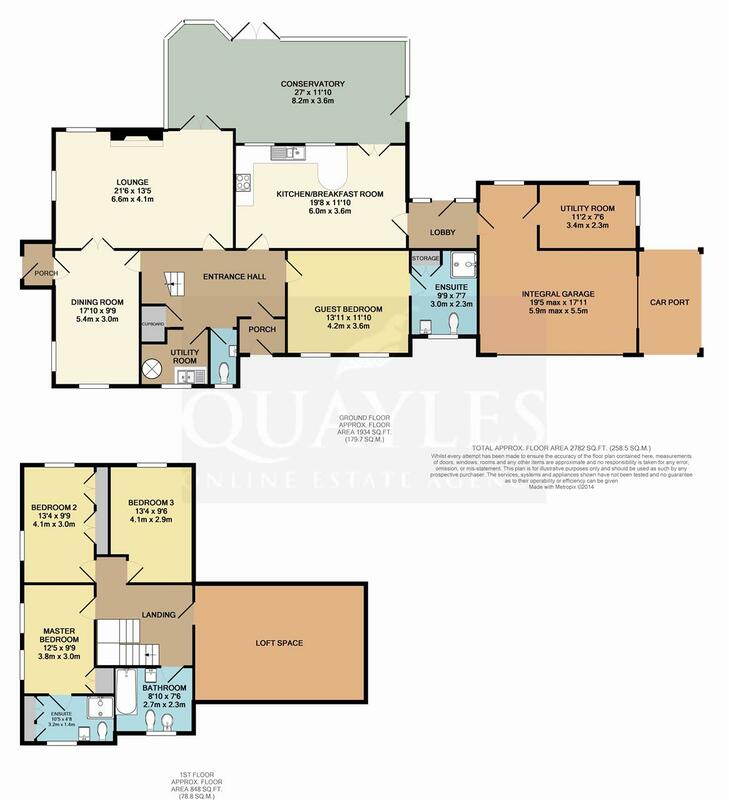 3 Further Bedrooms to the First Floor (1 en suite shower room) & Family Bathroom. Oil Fired Central Heating & Quality Hardwood Double Glazing to House. Quality Hardwood Doors and Woodwork Throughout. Integral Garage with Petitioned Workshop to Rear & Large Adjacent Carport. Sweeping Driveway, Ample Parking & Turning Areas. Formal Lawns Overlooking Fields with a Stunning Backdrop. Electric Fencing to the Fields. Separate Driveway to the Stables & Tack Room. 60 ft x 30 ft Agricultural Building with Single Phase Electrics. Travel into Sulby via Ballaugh and turn right at the crossroads just past the village store and continue along until reaching the crossroads. Take the right turn which is sign posted to 'Ballacaley' and continue down the lane for approx a quarter of a mile where the entrance and private driveway to Ballacaley Farm will be found on the left. A rare opportunity to acquire a superb country residence which occupies an excellent position set in approx 8.5 acres with unrivalled countryside views. Constructed in the late 1980's by the current owner and impeccably maintained throughout. The agents have absolutely no hesitation in recommending an early viewing in order to appreciate the many benefits on offer. NB The property has been designed to be wheelchair friendly with a spacious ground floor master suite (potential guest room) along with wider than average doorways and spacious reception rooms. Night light. UPVC woodgrain entrance door with double glazed side lights leading to the inner porch. Coved ceiling. Hardwood inner door again with side lights. Having an attractive half turned staircase to the first floor with deep understairs coat cupboard. Doors to utility and WC. Central heating thermostat. Coved ceiling with spotlight fittings. Quality 'Karndean' floor covering. Dual aspect windows enjoying fabulous views over the lawn down to the fields beyond. Glazed double doors to the conservatory. Attractive fireplace with an inset 8kw log burning stove on a marble hearth and a decorative surround. Quality wooden coving with paint overlay. 5 amp lighting circuit. Television, telephone and ADSL lines. Quality obscure glazed panelled doors to the dining room and conservatory. Glazed door to a secondary porch. Dual aspect windows again enjoying stunning garden to rural views. Painted wooden ceiling cornices and brass candelabra style light fitting on dimmer lighting control. Door returns to the reception hall. Night light, carpeted floor and a part glazed hardwood door with two steps down into the garden. A fabulous entertaining room enjoying panoramic views and having double doors to the lawn and a side door to the patio. Primarily of uPVC construction with blue solar easy clean glass roof. ‘Literoof’ warm roof system” fitted in 2015 and plenty of opening top lights. Three radiators and numerous power points. Television and telephone points. Ceiling light with integral fan. Wall light points. Ceramic tiled floor. Triple hardwood framed panels with central door to rear garden. Ramp and quarry tiled floor. Coat hooks. Door to garage. Fitted with a superb range of oak fronted wall, base and display units together with dresser unit incorporating spice drawers and cupboards. Breakfast bar with end display racks. Deep breakfast bar and work surfaces incorporating a four ring ceramic hob, two of which are high speed rings. Built in 'Hotpoint' electric double oven with grill and extractor above. 'Bauknecht' combi microwave. Built in larder fridge and freezer with drinks dispenser. Inset 1 1/2 bowl asterite sink with mixer taps. 'Indesit' integrated dishwasher. Two internal windows enjoying outlook out of the conservatory to the hills beyond. Background tiling and counter lighting. Coved ceiling and fluorescent lighting. Quality 'Karndean' floor covering extends through the breakfast area with hardwood door to the rear hall and glazed double doors to the conservatory. Fitted base units with deep inset stainless steel sinks with mixer taps and tiled surround. Airing cupboard housing the insulated hot water cylinder. 'Camray 3' oil fired central heating boiler. Plumbed for washing machine. Central heating controls. Coved ceiling. Hard wearing carpet. Fitted with a pastel grey suite comprising WC and wash hand basin. Coved ceiling. Obscure glazed window. Pull cord light. Lift up door with stairs leading to the wine cellar. Extensive wine racking to two walls. Light and power. Enjoying fabulous views across the front garden to the main entrance. Fitted with an excellent range of furniture comprising double wardrobe, bridging units, bedside drawers and shelving, together with a second single wardrobe with mirror front. Coved ceiling. Door to wet room. Almost fully tiled and fitted with a vanity unit with top mounted basin plus WC. 'Aqualisa' shower and low level corner shelving unit. Deep built in double store cupboard. Quality waterproof flooring. Mirror fronted vanity unit with power socket and shaver light. Coved ceiling. Obscure glazed window. Ample space for a bath if required. A naturally bright area with two high level 'Velux' roof lights. Loft access. Coved ceiling with recessed spotlights. Smoke alarm. Power points. With partial boarding and under floor insulation. Exposed trusses. Light. Two windows enjoying far reaching rural views. Coved ceiling. Recessed wardrobe with shelf and hanging rail. Door to shower room. Fully tiled to complement a pale grey suite comprising WC, vanity unit with top mounted basin and mixer taps, plus mirror fronted vanity unit with shaver point and integral light. Recessed cubicle with fully plumbed 'Aqualisa' shower and shelf unit. Coved ceiling and obscure glazed window. Built in triple wardrobe with top shelf and rail. Dual aspect windows offer fabulous rural views. Measurement excludes a wall of recessed wardrobes incorporating automatic lighting, top shelves and rail. Coved ceiling. A double room, again with rural views. Deep shelved recess. Coved ceiling. Fully tiled and fitted with a whisper grey suite comprising panelled bath with mixer shower attachment and curtain rail, vanity unit with top mounted basin and mixer tap together with mirror fronted vanity unit with integral light and shaver point. WC and bidet. Coved ceiling and obscure glazed window. Accessed via a wide, sweeping, tree lined, block paved driveway with lawn to one side. Stone wall and wooden gate to driveway. Vehicle access over cattle grid to an expansive concrete driveway with stone wall boundary and mature planted raised beds. Car port and access to rear garden. Formal lawn to front extending round to rear. Large double sized garage with fibreglass, electronically operated door to front and electronically operated roller door to side carport. Rear window. Light, power and coat hooks. Partitioned to the rear section with door to a workshop / store with two windows. Access to attic storage space. A fully galvanised structure with a concrete floor. Single phase electrics. £216. For more information please contact the rates department on (01624) 685661.